Room comes with a veranda, LCD TV, toilet, A/C(heating/cooling unit), refrigerator. 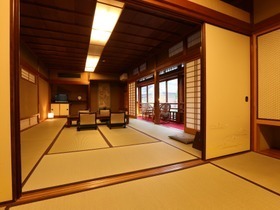 The largest room in the inn including connected two Japanese-style room (approx. 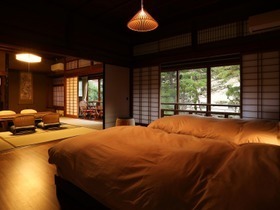 17m^2 / each) and twin bed room with Japanese garden view. Newly renovated. 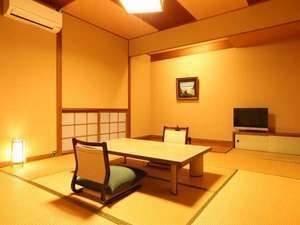 The room is on the first floor newly renovated in July, 2016 including connected two Japanese-style room (approx. 17m^2 and 10m^2) with Japanese garden view. Two rooms connect to make one spacious guest room. 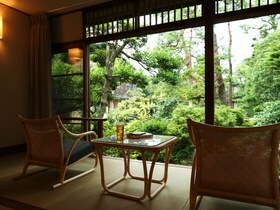 All rooms look onto the large Japanese garden, so that our guests may enjoy a view of all the seasons. 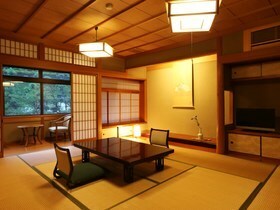 Japanese style room (approx. 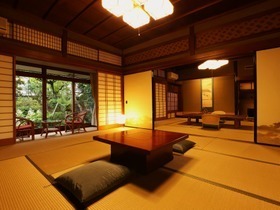 13m^2 or 17m^2) Warm wooden architecture in the traditional Japanese room. 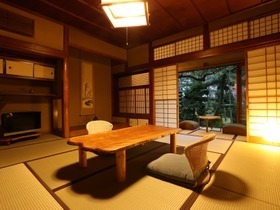 Room provides views of the large Japanese garden, inner garden. Spaicious Japanese-style room with hot spring town view. Two connecting rooms (approx. 23m-2 and 10m^2) recommended for large number of group.